Tailor-made for metal players and useful for anyone seeking aggressive distortion. Lots of tone-shaping options. Very sturdy build. Some may prefer a simpler control layout. 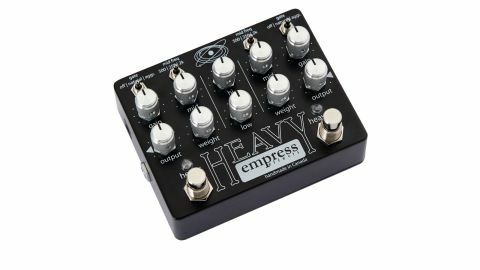 Designed as a source of high-gain tones, the Heavy from Canadian firm Empress features two independent channels (one with slightly more gain) that can either be voiced similarly so one acts as a boosted version of the other, or can be set up for two quite different sounds. "Each channel has a selectable noise gate with a choice of natural or aggressive settings"
Each channel sports gain and output knobs, a weight knob that changes the character of the low end, and a mid knob that offers a powerful 10dB of cut or boost at a frequency (500Hz, 250Hz, 2kHz) selected by a switch above it. Each channel has a selectable noise gate with a choice of natural or aggressive settings, while the whole output can be tonally tweaked by high and low shelving filters. Whether you want to scoop out some midrange or add girth to your high-gain distortion, the Heavy will cater to your needs, with or without the noise gate to keep hiss in check and your riffing tight and controlled.